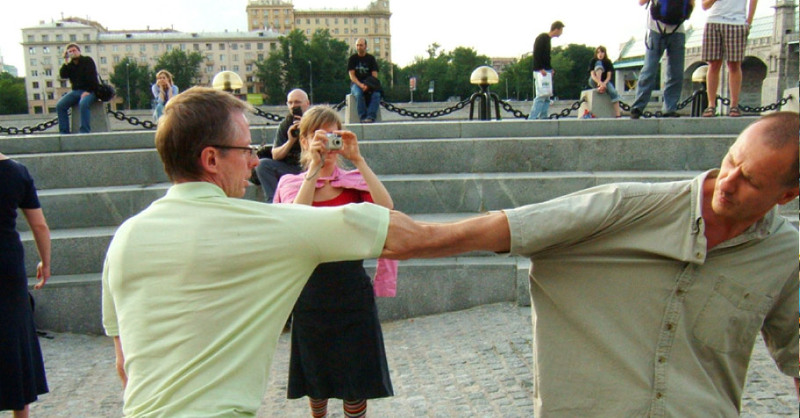 SKIN Moscow was realized in collaboration with the Contact Improvisation Festival Moscow, Russia. The students and teachers that participated in this project came from Russia, Ukraine, Germany, Ireland, Israel, etc. A first version was at the Cultural Center “Alfa-Plastic” on 19.07.06 as an interactive invitation into a CI Jam. The interactive happening lasted 30 min before it turned into a CI Jam. 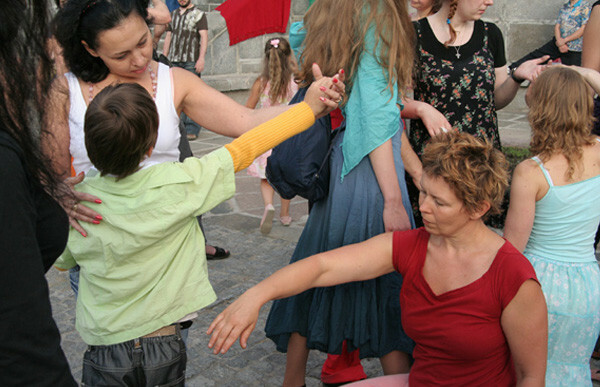 The second version on 22.07.06 was part of a longer outdoor performance Parcour to bring together people (friends who came for the theatre event as well as people from the street) in order to enter with us the Theater Stas Nemin for a performance. SKIN took place in the 30 min transition from the Parcour into the theater. In both cases I collaborated with the participants of the CI Festival for 2h offering some ideas for the interactive communication with the audience. The project was still in a quite experimental state of research with its concept not fully defined. A big group of the festival participants were dancers and photographers, the images we share were taken by Alfiya Shvedovskaya. Skin Moscow 2006. Photos by Alfiya Shvedovskaya.